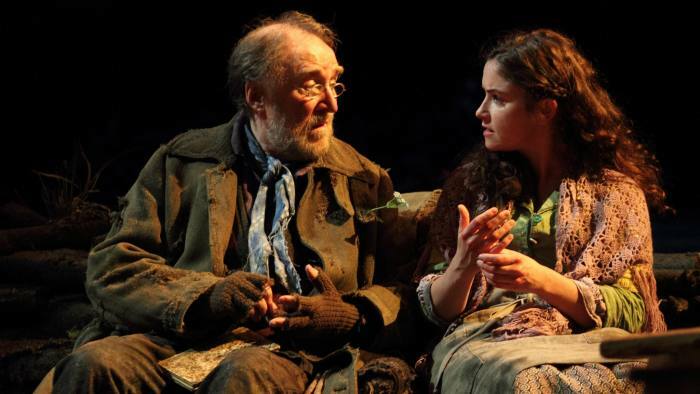 ‘What happens when a land is robbed of its language?’ This is the question National Theatre runs alongside its promotional material for the renowned Irish playwright Brian Friel’s Translations. It’s a fair question, but it is deceptively simple. It suggests the play deals with a single theme; a single core issue. It doesn’t. Translations is about the countless ways in which language frames our society, our homeland and our very way of thinking. It is deeply embedded in a particular cultural context. So what are the consequences for that cultural context if the language used to frame it starts to change? When a Gaelic word is replaced by an English one, what is lost? Translations is set in the fictional Donegal town of Baile Beag (literally, ‘small town’) in the 19th century, where aging alcoholic Hugh and son Manus (played by Ciarán Hinds and Seamus O’Hara, both from Game of Thrones) run a community ‘hedge school’ for local adult learners. Manus’ brother Owen (Colin Morgan, Humans and Merlin) returns to Baile Beag after six years, during which time he has made a success of himself in Dublin. But his return is not a social visit. He is accompanied by officers of the British military, who are producing a new Ordnance Survey map of Ireland and have hired Owen as a translator. He is tasked not only with translating the officers’ words to the locals, but also with helping to Anglicise the Gaelic names of Irish locations for the new map. Owen takes to this task with a reckless abandon, seduced by the English project to ‘clarify’ the ancient Gaelic place names that – he insists – have become vague, ambiguous and disconnected to their roots as the language has morphed over the years. He wilfully mistranslates the British Captain in order to make the project seem benevolent and even ignores the officers’ lazy, Anglicized mispronunciation of his own name (they persistently call him ‘Roland’). The locals are welcoming, and for a while it seems as if the language barrier between them and the military might not be an insurmountable obstacle to peaceful co-operation. But when an apparent tragedy strikes the regiment, the Captain’s ostensibly warm-hearted words turn quickly to violent threats. Only belatedly does the community realise that, irrespective of guilt or innocence, the buck is going to stop with them. Friel’s play powerfully explores the significance of language; of understanding and non-understanding; of names and misnomers. To the Irish locals, Gaelic is a language of hope, enabling them to look beyond their limited means and see a deeper beauty in the world. To the British Captain, the Gaelic speakers are primitives who cannot be understood and who are thus, ultimately, dispensable. (It is no coincidence that Friel gives a number of the locals some sort of physical or mental disability.) There is an idealised innocence in the world of the Gaelic-speakers, who do not perceive the British presence as a threat. Only Hugh and Manus – who themselves speak English – are wary. Owen’s enthusiasm for the modernising effect of Anglicisation blinds him to the deeper cultural significance of the old Gaelic names – the history they contain – and this is highlighted poignantly by his lack of indignance when the British cannot even get his name right. Unlike John Proctor (in Miller’s The Crucible), Owen has no real interest in his own name; he fails to see the value in it. It is a profoundly political play, in which a repeated theme in global history is pressed home: an occupier will always impose its language on the occupied. History is not only always written by the winner, it is invariably written in the winner’s language. And this holds not just as between different tongues but in the different ways of speaking and framing issues within a single language. This makes the performance of Translations in 2018 all the more prescient. For this is a time where Brexit brings with it enormous uncertainty for both Northern Ireland and the Republic. Arguments raging over a potential ‘hard’ border attack the problem using very different languages; while Brexiteers talk of ‘facilitation’ and ‘co-operation’ around the border, anti-Brexit campaigners frame it in terms of trouble around intrusive ‘infrastructure’, ‘border controls’ and a possible return to paramilitary violence. These languages are poles apart. Even the term ‘border’ in recent political arguments of this sort is misused; the border between the six counties and the Republic is in many places both arbitrary and invisible. It runs down the middles of roads, through fields of grazing livestock and even through individual homes. And yet the debate is painted, by the language used, as a significantly simpler one – as if ‘the Irish border’ were a single, clear crossing to be policed in this way or that way. The connection between a language and its people is every bit as invisible and yet every bit as present and significant as the border. But where a border has the potential to divide, language unites. It runs like a thread through communities, uniting people in purpose and understanding, enabling comprehension, teaching and learning, poetry, song and storytelling, political arguments and declarations of love. Language frames all issues. Translations is a beautiful production, featuring a strong ensemble cast. Judith Roddy and Michelle Fox in particular put in powerful performances as Maire and Sarah. 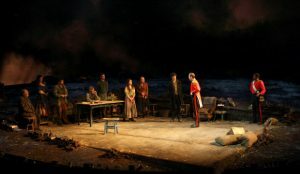 The set is a wonderfully clever piece of cultural juxtaposition; the organic-looking stage representing the rolling Irish countryside being gazed upon by an audience sat in the brutalist, concrete box of the National Theatre. It mirrors the tension between what Friel paints as the idealistic, optimistic Gaelic language and the utilitarian English tongue that seeks to supplant it. Can beauty survive the brutalist onslaught? Go and find out. 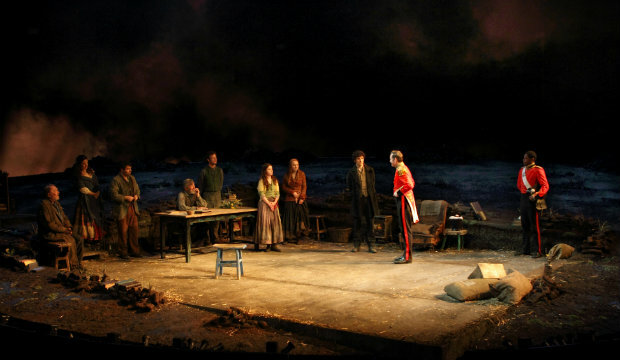 To find out more and book tickets for Translations visit the National Theatres website. If you liked this review you might also like Musical Theatre Musings review of Tartuffe, Schism and Into The Woods.